The "Prison Pup Program" was conceived out of a dream from a tenacious woman named Sister Pauline Quinn. Already being the trailblazer for many other Prison Training programs in which inmates are trained, mentored and finally trusted with the privilege and responsibility of training dogs for service to the disabled community, Sr. Pauline Quinn made a call to John Dovey, Warden of CIW in 2002. She also contacted Carol Roquemore, CST's founder and CEO. Due to her tenacity and her belief in the rehabilitative benefits for the inmates and the obvious assistance they could provide to the community, in addition to the expectation of being able to shorten a nearly three year waiting list for service dogs, both John Dovey and Carol Roquemore could not say no. They embraced the opportunity to see the good that could come out of such a match! 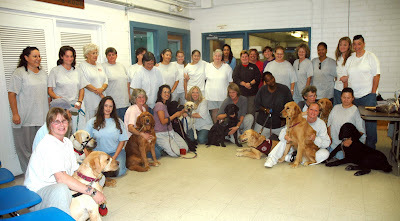 In September of 2002, the California Institution for Women became the first prison within the state of California to have a Service Dog Training Program. Four puppies between the ages of five months and seven months walked into the prison to become California's first "Prison Pups in Training." For the first time in over twenty years for some of the inmate volunteers, they were able to hold a puppy, feel the love a puppy could give, and provide for this puppy some much needed socialization and training. Since it's inception, the "Prison Pup Program" has grown in leaps and bounds. The inmate trainers are now playing a vital role in the training of service dogs for the disabled community. Canine Support Teams soon realized that because of the dedication and attention to detail that the inmates demonstrated, that these women would be crucial in the task of advanced training for service dogs. What a perfect marriage! Dedicated women that had the time to devote to training a dog and wanted to give back to society~and individuals in the community that needed assistance. We have grown significantly since September of 2002. What began with four puppies and approximately twenty participants, has grown into the current program of twenty dogs and over sixty inmate participants. Over eighty-five percent of the dogs that we place yearly with clients, are trained through the Prison Pup Program. Canine Support Teams would like to thank each and every individual that contributes to the success of the "Prison Pup Program." Without your encouragement, your enthusiasm and your care and concern for the dogs and the mission of this program, we could not accomplish all that we have in such a short time!